Alitany, Ayman; Redondo, E.; Adas, A.
XXIV International CIPA Symposium "Recording, documentation and cooperation for Cultural Heritage"
ISPRS Ann. Photogramm. Remote Sens. Spatial Inf. Sci., II-5/W1. XXIV International CIPA Symposium "Recording, documentation and cooperation for Cultural Heritage"
The Roshan represents one of the most characteristic aspects of traditional architecture in Hejaz (Saudi Arabia) and a frequent feature in most of the Historical Jeddah's heritage buildings. The old city has witnessed continued degradation recently, which has caused the loss its traditional architecture and hundreds of these projected wooden windows. Documentation is a major step towards heritage preservation, whether threatened by man-made or natural factors. However, due to the absence of specialists and experts an architectural database of the Roshans does not exist. Surveying these architectural elements is a very laborious and difficult process when using conventional methodologies including the laser sensors approach mainly due to the onsite limitations. 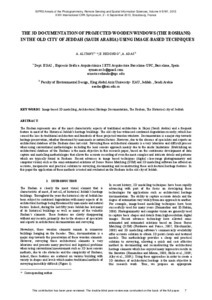 Establishing an architectural database of the Roshans is the main objective in this research paper, based on the continuous development of data capture and modelling methodologies that allows the accurate recording of even the most complex and intricate details and patterns which are typically found in Roshans. Recent advances in image based techniques (digital close-range photogrammetry and computer vision) such as the semi-automated solutions of Dense Stereo Matching (DSM) and 3D modelling software has offered an accurate, inexpensive and practical solution to surveying, documenting and reconstructing these architectural heritage features. In this paper the application of these methods is tested and evaluated on the Roshans in the old city of Jeddah. Alitany, Ayman; Redondo, E.; Adas, A. The 3D documentation of projected wooden windows (The Roshans) in the old city of Jeddah (Saudi Arabia) using image-base techniques. A: International CIPA Symposium. "ISPRS Ann. Photogramm. Remote Sens. Spatial Inf. Sci., II-5/W1. XXIV International CIPA Symposium". Strasbourg: 2013, p. 7-12.